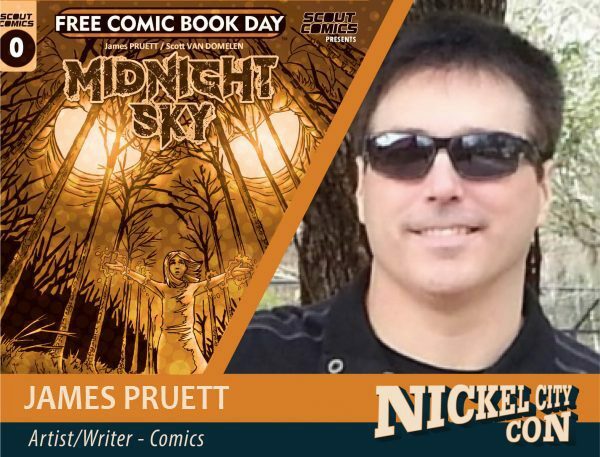 James Pruett is the Publisher of Scout Comics and writer/creator of MINDBENDER and the upcoming MIDNIGHT SKY series which premieres on Free Comic Book Day. He brings extensive industry experience stretching over two decades. He began his career as one of the co-creators of the Eisner Award nominated anthology series, NEGATIVE BURN and was the Managing Editor/ Associate Publisher of Caliber Comics from September 1994 to January 2000 where he helped propel Caliber to its height as a top ten comic publisher in the latter half of the 1990s. While at Caliber, he created THE APPARITION, BLACK MIST, SOJOURN, BOOK OF ANGELS, NEW WORLDS ANTHOLOGY, CALIBER CORE, STRAIT JACKET and co-scripted the popular, fan favorite KAOS MOON series that was published first by Caliber, then Avatar, Tusk and other European publishers. James over his career has also edited 100’s of titles for Caliber, Tusk, Image and others.Following Caliber, James served as Editor for Tusk Entertainment and continued to write for Desperado Publishing and wrote an issue of X-MEN UNLIMITED for Marvel with art by Mike Deodato, Jr.